If not because of its curved display on the right side of the screen, the Note Edge will probably look like the Note 4. In fact, even with its new display technology or even if the brand label is taken away, you can tell by the looks of it that it's a Samsung device. It officially weighs 176 grams and has dimensions of 151.3 x 82.4 x 8.3 mm. Based on these numbers it is lighter, shorter, wider and thinner than the 4th Note. But you really can't tell even when you place them side by side because the differences aren't that much to be noticed by a naked eye. This is the game changer because it made Note Edge unique and people would want to know the benefits of the curved display. This is also the component that explains why the phone is called 'Edge'. It's Super AMOLED screen measures 5.6 inches (not including the curved part), which is 0.1 inch short of Note 4's, but the curved side added 160 pixels to it giving the phone a higher resolution at 1600 x 2560 pixels. If you're keeping note of mobile devices resolutions, it's the highest to date. When it comes to capturing great pictures, the Note Edge cannot be left behind with its 16-megapixel primary camera that comes packed with features that are also present in the Note 4. Among its many features are dual shot, image stabilization, geo-tagging, HDR, panorama, etc. The secondary camera has 3.7 megapixels, which can capture good selfies. It's official, Samsung will release two variants; 32GB and 64GB models. It also has a microSD card slot that supports up to 64GB of external storage. The phone also features USB OTG (on-the-go), which means that it can read and write directly from and to any thumb drives. So, if you have a 64GB flash drive, you can double the external storage of the phone. The company has given Edge 3GB of RAM in preparation for Android L, the first Android version to support 64-bit architecture, although, it will be released running Android 4.4 KitKat. Samsung didn't mention about the updates yet but it's a predictable move if it wants its device to stand out in already evolving mobile market. If you've read about the Note Edge sporting an octa-core processor, that's true. But if you've read about it having a quad-core processor, that's also true. In the U.S., it's the quad-core variant that will be widely distributed and carried by wireless companies because it uses the Qualcomm Snapdragon 805, which is compatible with wireless technologies in the country. The octa-core variant, however, will be distributed to select markets only. Both variants are equally powerful and has their own advantages and disadvantages depending on the market they're distributed. 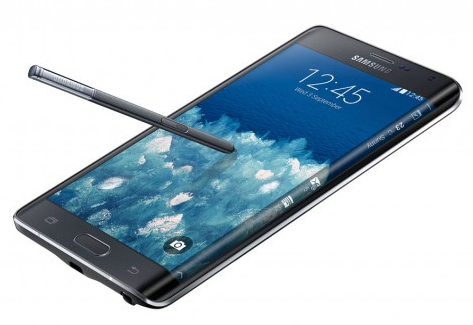 The Galaxy Note Edge will have a 3000mAh battery, which is slightly underpowered by 4th's battery (3,220mAh). Since majority of their specs are identical, you can expect that Edge will run out of battery first but it will be just in a matter of minutes to an hour. But take note that battery may drain faster or slower depending on the number of apps and services running, the level of screen brightness, the network the phone is connected, etc. The point is, with 3000mAh battery, the phone can reach up to 20 hours or more of talk time, browsing, streaming media, and more. Samsung didn't just a build a big phone with curved screen, it made sure that the extra touchscreen on the edge is useful. Its first obvious function is to show notifications without turning the whole display on. And the second, it gives users additional controls over the phone with new buttons. Third, you can drag and drop your favorite apps on it for easy access. Another breakaway feature of the Note Edge is its metal frame. While Samsung didn't say if it's going to build its future flagships with metal frames but it's a start of something better. Both the Galaxy S4 and S5 were widely criticized for having all plastic frames but that's not gonna happen to both Note 4 and Note Edge. The phone also has a quick charge feature that allows it to charge its huge battery up to 50% in just 30 minutes, thanks to Qualcomm's technology. However, it has to trade its USB 3.0 for it. Needless to say, it only has USB 2.0 but anyone could live with that. Samsung didn't provide the exact figures yet but it's almost certain that the Note Edge's price will be on par with that of Note 4's. In the Netherlands, some retailers are already accepting Note 4 pre-orders ranging between €795 and €799. For sure Edge's price will also be within that range. While its sibling is slated for release later this month and earlier in October for the U.S. market, the Note Edge will be made available later in October according to reports.